Leaving a dangerous object in a patient’s body or letting air or gas bubble form in the blood are among the most serious medical errors committed by hospitals. Except for New York Presbyterian, no other New York hospital committed such errors during the spring of 2018. 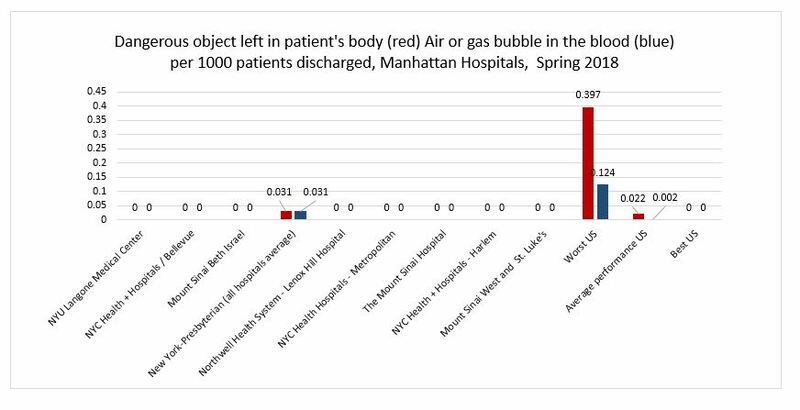 At New York Presbyterian which doesn’t provide specific data for each hospital in Manhattan but only for the group, the rate of dangerous objects left in patient’s body was 0.031 for 1000 patients. This was higher than the national average rate (0.022) but much below the worst national one (0.397). New York Presbyterian also had a rate of 0.031 per 1000 patients discharged suffering from air or gas bubbles in the blood. This is much higher than the national average of 0.002. The worst score was 0.124. An air or gas bubble stops blood from flowing through the body. Air or gas bubbles are serious mistakes that can happen during surgery or other procedures. If the blood flow is blocked, a patient can suffer a stroke or die. An important measure of hospital safety is the rate of patients acquiring an infection during their hospital stay. The Leapfrog Hospital Safety Grade includes five (5) healthcare-associated infection measures: central line associated bloodstream infections, catheter-associated urinary tract infections, surgical site infections following major colon surgery, lab identified MRSA bacteremia among inpatients, and lab identified Clostridium difficile among inpatients. 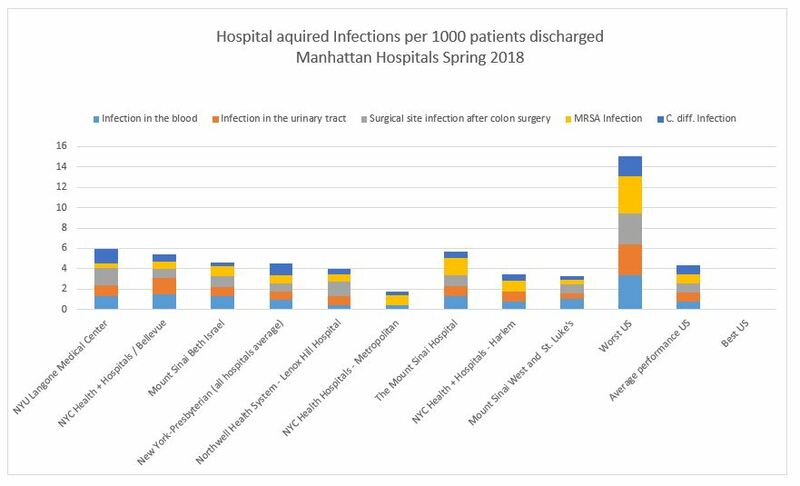 Patients at NYU Langone Hospital and NYC Health + Hospitals / Bellevue as well as patients at The Mount Sinai Hospital are the most at risk of acquiring an infection during their hospital stay. Patients at NYU Langone Medical Center have a high risk of developing infections of the surgical site after a colon surgery. These types of infections develop in the part of the colon where the surgery took place. If not treated proprely they can spread to the rest of the body and in the worst cases patients can die. These infections usually occur when the hospital doesn’t use appropriate antibiotics before the surgery, when the skin is not cleaned with an appropriate soap or when a patient is not proprely monitored after the surgery. 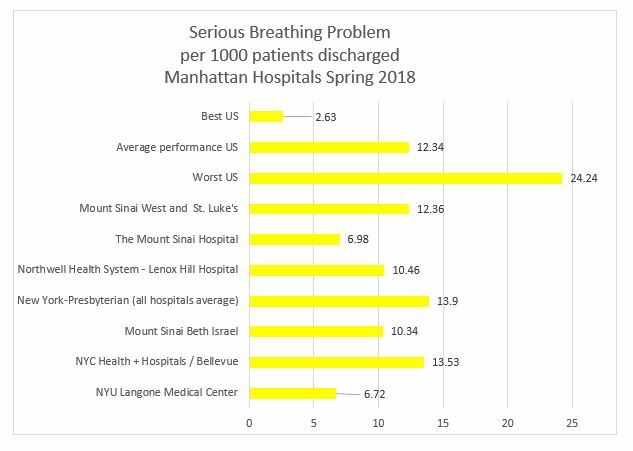 While the best hospitals in the country have a spotless score of 0 infections per 1000 patients discharged, the NYU Langone records 1.672 infections per 1000 patients discharged. This is almost double the national average (0.855) but half the score of the worst hospital in the country (3.081). NYU Langone also recorded the highest amount of Clostridium difficile infections of all Manhattan hospitals. C Diff causes diarreha and abdominal pain. It is often spread via contaminated equipment or negligent staff failing to wash their hands proprely. Bellevue has the highest rate of blood infections and urinary tract infections in Manhattan. Blood infections usually occur when a hospital staff member doesn’t follow the safety guidelines when inserting a central line into a patient. Urinary tract infections occur when the staff is not proprely cleaning or maintaining the urinary catheters. These dangerous infections are mostly caused by negligence and are preventable. The Mount Sinai Hospital has a major problem with Methicillin-Resistant Staphylococcus aureus (MRSA). This staph bacteria is resistant to many antibiotics. MRSA can be found in bed linens or medical equipment and can be spread if healthcare providers do not properly wash their hands between patients. The Mount Sinai Hospital needs to make sure doctors and nurses clean their hand after caring for each patient. Rooms and medical equipment should be cleaned more often and more thoroughly. The Hospital should also make sure to separate MRSA patients from other patients and take special precautions with visitors such as the usage of gloves and gowns. Infections also have a higher risk to occur if a surgical wound splits open or if the patient suffers from an accidental cut or tear of the skin or other tissues. Patients who underwent a major surgery of the stomach or the abdominal area are the most at risk of a wound split while cuts and tears occur mostly during procedures involving the abdomen and pelvis. 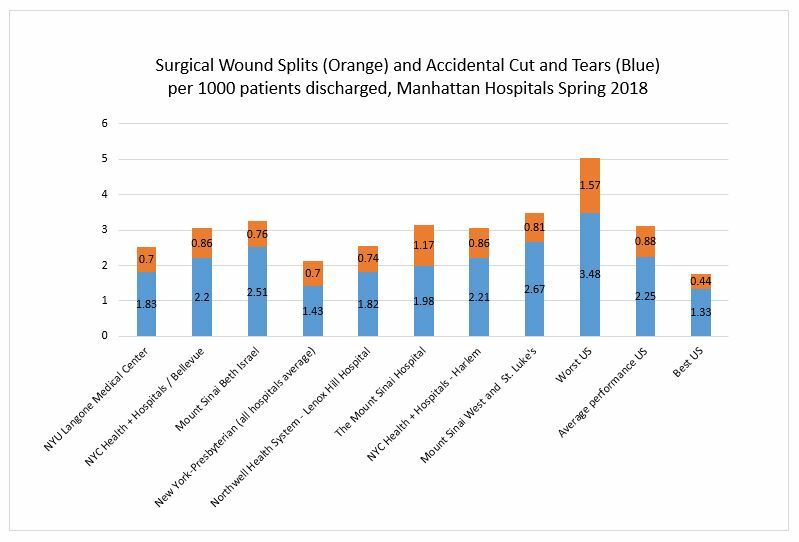 Mount Sinai West and Mount Sinai St Lukes which provide global statistics for both hospitals together had the highest rate of accidental cuts and tears and the third highest rate of surgical wound splits just behind NYC Health + Hospitals – Harlem and NYC Health + Hospitals / Bellevue. Wound splits are not the only issue than can occur after a surgery. A significant number of patients experience difficulty with breathing because their lung either cannot take in enough oxygen or cannot get rid of carbon dioxide. Doctors and nurses must make sure to proprely monitor symptoms such as shortness of breath to avoid these problems. On average for all American hospitals 12.34 discharged patients out of 1000 experience a serious breathing problem. The Presbytarian, Bellevue and Mount Sinai West and St Luke’s all scored worst than the national average. Another dangerous condition related to breathing called collapsed lung occurs when air leaks out of the lung and goes into the area between the lungs and the chest wall. It can happen when a doctor or nurse is inserting a catheter, a feeding tube, or even a pacemaker. This is a very rare but extremely serious medical medical malpractice. 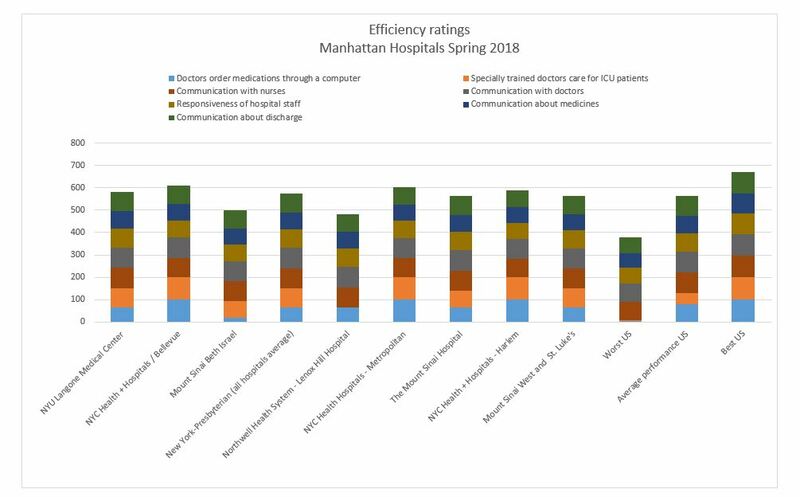 4 hospitals in Manhattan are performing slightly better than the national average. After a surgery, patients have a higher risk to develop dangerous blood clots. A good hospital will closely monitor surgical patients for this potential condition. Compression devices as well as blood thinners can be used to prevent this condition. Making sure the patient gets out of bed and walks as soon as possible is another way to prevent blood clots. Blood clots usually form in the leg but they can travel through the blood stream and get stuck in the lungs preventing oxygen to get into the blood and ultimately leading to the death of the patient. 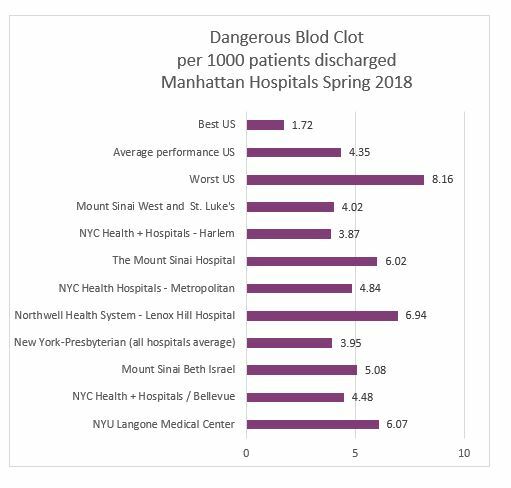 Lenox Hill, NYU Langone and the Mount Sinai Hospital are the 3 Manhattan Hospital that have recorded more than 6 cases of dangerous blood clots per 1000 patients discharged. As a comparison, the national average is 4.35. After a surgery, patients may develop serious complications such as kidney or liver functions deteriorating, heart condition or pneumonia. A good hospital will usually be able to treat these problems and keep the patient alive. However some hospital do not manage these serious conditions proprely and the patient dies. Out of 1000 patients discharged, the best hospital in the US recorded a rate 0f 93.16 deaths from treatable serious conditions, the worst hospital recorded 174.25 deaths. The national average is 138.9. 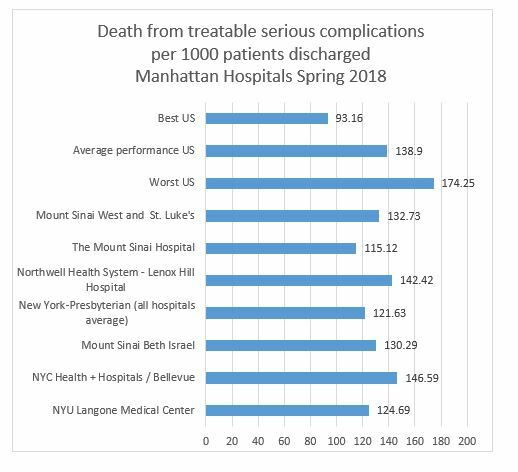 Bellevue and Northwell Health System – Lenox Hill Hospital both recorded a number of deaths from treatable serious complications that was above the national average. High rates of patient falls and bed sores are clear signals that hospitals do not proprely take care of their patients. Bellevue has the worst record nationally for dangerous bedsores with 1.35 patients out of 1000 discharged developing dangerous bedsores. Bellevue also has the highest rate of patient falls among all New York hospitals. 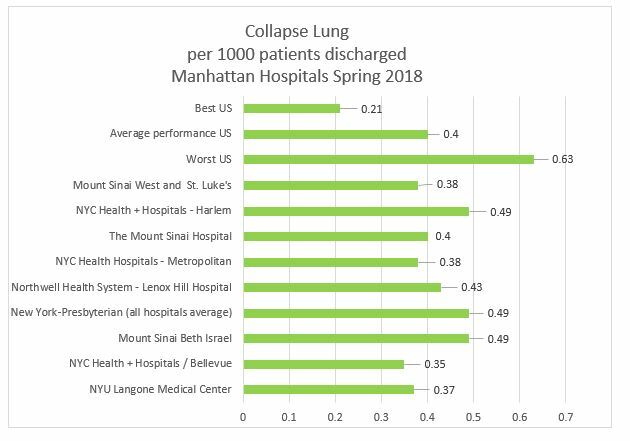 Surprisingly despite having major patient safety issues such as a high rate of bedsores and patient falls, The Leapfrog Group rated the Bellevue hospital as the most efficient in Manhattan. Doctors order medications through computers and they also have a great team of doctors specially trained for ICU patients.